If you are still at the scene of the accident and have not done so already, Call 911. If you, or anyone else are injured seek medical attention. If your injuries require you to see a doctor, be sure to follow your doctor’s advice and treatment plan. Take notes and pictures of all of the important details of the scene. Secure the names of every other driver involved in the accident as well as any witnesses. Do not volunteer any information regarding who is at fault. Do not say that you are sorry or make any similar statement. After an accident, it’s extremely important to move quickly to ensure that important evidence is preserved. Oftentimes the accident report fails to correspond with the true events and conditions that led to the wreck. It is important that a victim of a motorcycle accident in South Carolina is represented by a Motorcycle Accident attorney who can use resources beyond an accident report to demonstrate what really caused a collision, secure critical evidence, and to fight for fair compensation for an injured victim. If retained early enough, the Strom Law Firm, LLC’s South Carolina motorcycle accident attorneys will carefully analyze all aspects of the sequence of events, road conditions, and mechanical factors that led to the collision. These results of this investigation can be critical to determine if a negligent driver is to blame for the collision. Depending upon the accident location, video surveillance may be obtained as well. Investigating the scene can help substantiate what actually occurred and ultimately help ensure that a victim of a motorcycle accident receives proper compensation. If you have been involved in a motorcycle accident, you may be eligible to receive compensation for your losses. and a claim for wrongful death of a loved one. Navigating through a motorcycle accident claim can be extremely confusing. It is important to have an attorney who will stand up for your rights and protect your legal interests. In our initial free consultation, we will meet and review the FR-10, obtain additional information regarding what occurred, and learn more about the injuries which you sustained, as well as your anticipated treatment. Immediately after being retained, we will send a letter of representation to the adjuster assigned to defend the case, and begin organizing your critical documents so that we may put together a demand in your case. We will also obtain your permission to order all relevant medical records and bills. These records will help substantiate the injuries you have received. If you are undergoing medical treatment, we recommend that you follow your doctor’s recommended treatment plan to maximize the amount of compensation which you will receive. If you have suffered lost wages, we will contact your employer to obtain verification of the compensation to which you are entitled. These calculations will be included in your damages. 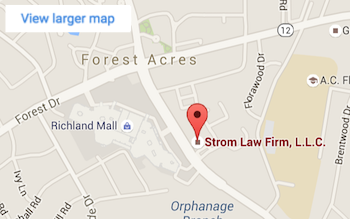 Depending upon how quickly we are retained after the accident, the Strom Law Firm will also appear with you in traffic court if the at-fault driver chooses to contest the ticket. Securing Compensation For Your Motorcycle Accident Claim. Our clients often ask how long they should expect their motorcycle accident claim to take. The answer depends on a number of factors including the amount of medical treatment needed to return the client back to normal. Forgoing necessary medical treatment for a quick recovery can leave you personally responsible for medical bills and undervalue your claim. When you have reached maximum medical improvement and/or finished treating, our Motorcycle Accident lawyers will file a demand with the insurance company seeking compensation on your behalf. Depending upon the facts of your case, we may be able to resolve your motorcycle accident claim without filing a formal lawsuit. However, if we are unable to resolve your claim, we will file a lawsuit, and if necessary, pursue your case through a jury trial. If you have been the victim of a motorcycle accident through no fault of your own, and think you may be entitled to receive compensation for the injuries which you sustained, give us a call today. 803-252-4800. Below you will find additional information regarding motorcycle accidents in South Carolina. According to the South Carolina Department of Public Safety (SCDPS), a motorcyclist is killed every three days in South Carolina. Motorcycles lack the protection of an enclosed vehicle and offer little protection to a rider in the event of an accident. The sheer size and weight disparity between car, truck, or SUV and a motorcycle increases the likelihood of serious injury, or even death, to a rider injured in a motorcycle accident. In 201o, motorcycle injuries resulted in 751 hospitalizations and 2,963 emergency room visits resulting in $73, 718, 189.00 in medical bills. 74% of riders who were hospitalized and subsequently died, were diagnosed with a traumatic brain injury. Wear a helmet and appropriate safety gear. Helmets are 37% effective in preventing a motorcycle death and 67% effective in preventing a brain injury. Participate in a South Carolina Motorcycle Rider Training Class. Ride Defensively, look for signs that another driver may turn in front of you, and the avoid blind spots of other drivers. Many times the at-fault driver does not see the motorcycle until it is too late. Recovery after a motorcycle accident can be difficult. You may be out of work, suffering lost wages, and facing costly medical bills. We are here to help. While we cannot change what happened, our Motorcycle Accident Lawyers will move quickly to make sure that your rights are protected so that you can focus on your recovery. 803.252.4800.